If Eugene didn’t have four legs, he’d be the type of person who rode a Harley, had porkchop sideburns, and sported battered leather jackets. Or at least people thought he would be that type of person. Except he detested leather – aside from what could be found on old books and exceptionally well-made shoulder bags. And sideburns were tedious. Motorcycles disturbed his sensitive ears. He just wasn’t who people thought he was, and it hurt that people thought him scary. Because it was painful and because he couldn’t help how he looked – one purple eye, a patch, and fangs – Eugene embraced people’s perception and set up an automatic glamour spell that turned into the full specter of an aging punk-rocker whenever he left the house. It just seemed easier to actually be scary than just to be thought it. Eugene didn’t know why he wasn’t the beautiful kind of unicorn, all glowy white dust and quiet woodland scenes. On the online dating sites where he lurked, his profile always garnered lots of emails that begin with things like, “So you’re a unicorn? That’s my favorite mythical creature.” He was sure there was some sexual fetishism here since most of those women certainly thought “unicorn” was some sort of euphemism. It wasn’t. He was a white horse with a big white horn coming out between his eye, or rather between his eye and his patch. At least he was when he was home. Eugene didn’t have any friends – not since the Yeti left – so most days he just wandered the streets of Gloaming Gap. He’d stop and look in at the soda counter or wander by Town Hall to see how many fairies he could count hiding in the shrubbery. People crossed the street to avoid him, and the occasional scared and slightly mean child heaved a half-finished milkshake at his back. Then, Eugene turned and looked at them. They thought he was glaring and ran into their mothers’ legs. The women stared at Eugene, furious and nervous. He always walked away slowly, his head hanging so low that, had it been visible, his horn would have scraped the concrete. Each dusk when he returned home, he almost always found one or two packages with handwritten tags that included names and addresses. In the evenings, he settled at his high library table he bought at an estate sale fifteen years ago, turned on the tall Tiffany lamp set just off to the side, and set to work repairing the town’s timepieces. People were scared of him, but they knew he did good work. 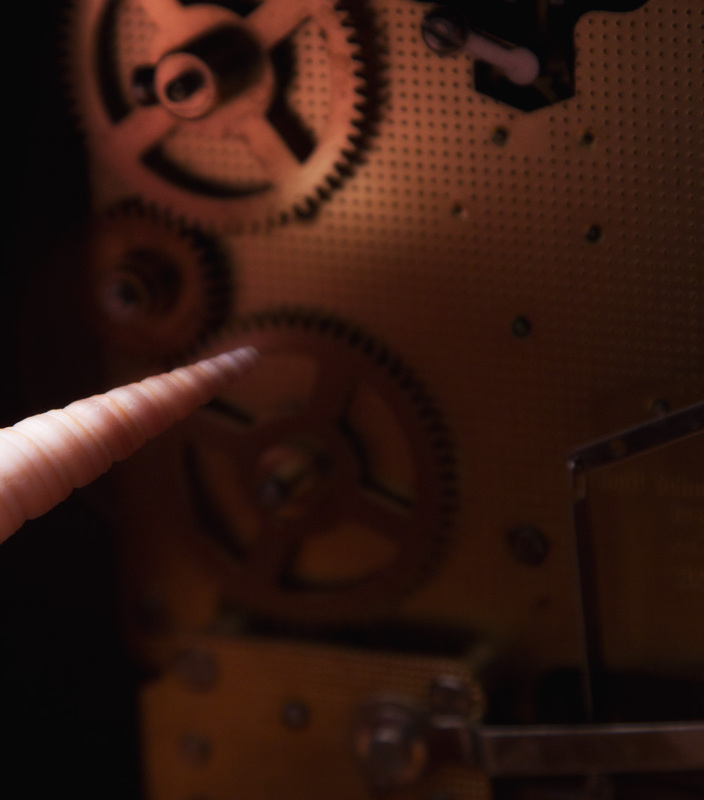 Eugene had developed a dexterity with his horn that made even the tiniest watch a joy to work on. He loved the sounds of the clocks, and when they worked right – all those brass gears and tiny springs moving perfectly, functioning just as they were made to function – he breathed deep. Something was the way it should be in the world. When each clock or watch was repaired, he put them back on the porch with an invoiced attached. The owners dropped the payment through his mailbox and walked away happy, with their anxiety of Eugene fading. It was a full-proof system. Except for the part where people were still afraid of him. One night, Eugene had completely disassembled a platinum Patek Phillipe pocketwatch. Its face, separated from its workings showed 8:17, but Eugene knew it to be later. More like 11. Outside, Eugene heard just the shortest of squeals, like a mouse run flat, but louder. And bigger. A person screaming and then being dampered by a quick hand. He looked up and out the window beyond his desk briefly, didn’t see anything but parked cars on the quiet street, and put his horn back into the striking mechanism. Just a cat, he thought. But in the back of his mind, Eugene couldn’t shake that sound. Something didn’t seem right. He draped a black cloth over the watch and went out on the porch. The night still seemed quiet. He turned to go back inside when he heard it: The faintest of dragging sounds moving along the sidewalk just out of sight. Could be someone dragging a garbage can, he thought. But it wasn’t garbage pick-up tomorrow, so as quietly as he could, Eugene walked off the porch and toward the sound. As he got closer, he saw them – a man dragging an unconscious woman in a big puffy black coat to the corner where the park gate was open. “Hey, you,” shouted Eugene. The man looked up, startled. A look of anger turned quickly to fear as he saw Eugene. He dropped the woman hard to the pavement and ran. Eugene started to give chase, but as he jogged up beside the woman, he glanced down. She was bleeding. A lot. He stopped and bent over her. She didn’t look good. She needed a doctor. But Eugene was afraid. If he took her to the hospital, he could be blamed for her injuries. He wasn’t even sure he could carry her there. He couldn’t just leave her there, though. So he carefully tucked his forelegs-turned arms under her back and legs and carried her back across the street and into his house. He held the glamour spell just long enough to nestle her gently between some pillows on his deep, soft velvet couch. Then he took the afghan and draped it over her. He spread out his first aid supplies beside the covered pocketwatch and began to clean the wound on her head. It looked like she had been hit hard by something. Eugene needed to stop the bleeding. He pressed, as gently as he could, the sterile pad onto the wound and then trailed a roll of gauze around her chin and up over the pad. She looked a bit like a kid from the ‘50s whose wisdom teeth had been removed, but at least she wasn’t bleeding anymore. As she slept, Eugene worked at his table, putting the pieces of the platinum pocketwatch back together. He stopped every half-hour or so and mop her brow with a wet handkerchief. They passed the night this way. When the sun was just cresting over the tops of the trees, the woman began to stir. Slowly at first, as if her dreams had been pleasant, but then she flailed upright. As she looked around the room, Eugene kept his flanks toward her, hiding his face. But he couldn’t help peeking a glance at her, and when he did, the sun caught his horn just a bit. He watched her touch her head, spreading her fingers across the gauze staunching her wound and smiling, slightly. As she tried to stand, she made enough noise to worry Eugene. He had been listening all along, but since so many people found his face frightening he stayed still until he began to fear she would fall and hurt herself again. Then, he turned, slowly, so she could see his face, and he reached out his horn to steady her. She placed a soft hand there and pushed upright. When Eugene thought she was balanced, he lifted his head slightly. She gasped, just a little, and then smiled. “I know you, don’t I? I know I’ve seen that eye patch before. And the purple eye. . . Wait, you’re the punk that walks around town all the time. “ She looked around his living room with the grandfather clock and the shelves of books. “Some scary house you have here, sir,” she said with just the lightest bit of teasing. If unicorns could blush, Eugene would have. No one had ever been in his house before, so there was that. But also, no one had ever actually spoken to him since his parents died when he was a colt. Certainly, no one had ever smiled at him so warmly. Eugene returned from the kitchen with a glass of water on a tray suspended from a hook on his horn. Just because he’d never had people over didn’t mean he hadn’t hoped to. “It was nothing,” Eugene whispered.